Sam Husseni, who was covering the Trump-Putin summit on behalf of The Nation Magazine, was booted before the news conference between the world leaders. 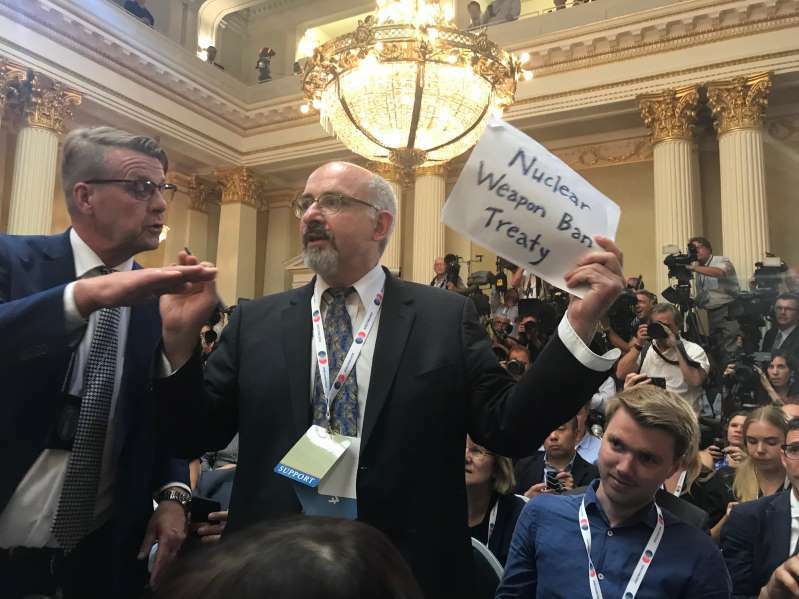 [post_ads]Moments before the highly anticipated press conference between President Trump and Russian President Vladimir Putin on Monday, a credentialed member of the media holding a sign reading "Nuclear Weapons Ban Treaty" was kicked out of the room inside the Presidential Palace in Helsinki. He was later identified as Sam Husseini, the communications director of a Washington non-profit who was covering the Trump-Putin summit in Finland on behalf of the magazine The Nation. Video of the incident shows Husseini holding the sign before security quickly grabbed him and forcibly took him out of the venue. Husseini was removed twice, initially cooperating with security agents and exiting the media area. He came back, however, and brandished a sheet of paper with writing on it, at which point he was removed by force. CBS News' White House correspondent Weijia Jiang was nearby when the removal unfolded. "It started when he was heckling those of us who were in the middle of reporting and two members of the security detail confronted him about it," Jiang told CBSN. "He came out and showed a sign that he apparently made that said 'nuclear weapon [ban] treaty' and that's when this all unfolded and intensified." A Secret Service spokesman told CBS News the man caused a "disturbance" after returning to his seat and "was physically removed from the room by Presidential Palace security personnel." Caitlin Graf, a spokeswoman for The Nation, said Husseini, who is the communications director of the D.C.-based Institute for Public Accuracy, confirmed he received press accreditation from them and condemned his removal from the press conference. "At a time when this administration consistently denigrates the media, we're troubled by reports that he was forcibly removed from the press conference before the two leaders began to take questions," Graf said. "This is a developing situation that we will be following closely." Ahead of Mr. Trump and Mr. Putin's trip to Helsinki, Finnish newspaper Helsingin Sanomat bought 300 billboards on the routes from the airport to the summit reminding them of the "importance of the press," according to their senior editor-in-chief Kaius Niemi. The messages were filled with news headlines regarding the leaders' attitudes toward press freedom.